Until I purchased my Auto Ordnance 1911PKZ last September I had never owned a center fire pistol. I selected this manufacturer primarily on the combination of price and the positive reviews the pistol received from the American Rifleman and another pistol magazine. I selected the model because I am very interested in military history in general and the inventions of John Moses Browning in particular. This model has a parkerized finish that is a slate gray/black tone in keeping with the military model. There are no rough spots and the finish is very attractive if you appreciate military metal finishes. The plastic grips are nothing to get excited about but then, the military grips I have seen are not better. Overall, the fit of the parts is very good. Of course, the slide will “rattle’ when you shake the pistol vigorously but not more than a Remington WWII model I was able to inspect alongside mine Auto Ordnance. I need a barrel bushing wrench to disassemble and assemble the pistol. Now I understand that there are many variations in the military versions of this pistol, a factor I didn’t really appreciate until I began to shoot it. It has a mix of the features you would expect to find on either the 1911 or the 1911A1 version, that is, scalloped frame near the trigger (1911A1), a “long” trigger (1911), and an arched mainspring housing (1911A1). 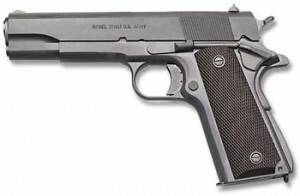 The thumb safety flange is the larger, post-WWII Colt design which is bigger than the stubby safety of the GI pistols. The grip safety spur is of a sufficient length to protect the webbing of my shooting hand, like the M1911A1 version. The A-O hammer is very similar to the short, wide Colt hammer adopted in 1939. There are at least four differences between this pistol and the original GI version. First, the serrations on the slide are canted forward at the top such that they line up with the angle of the handle. Second, the magazine well is beveled. Third, the ejection port is larger in that the bottom edge is lower than the GI version. Finally, the barrel is throated. The sights are of the tiny GI type and the thumb safety looks like the GI version. As I mentioned before, I had the opportunity to inspect the pistol along side a WWII Remington model and noticed two differences in feel. First, the Auto Ordnance’s trigger has some “crunch” in both the action of the trigger and the thumb safety while the WWII model was smoother in both operations. When you squeeze the trigger on my pistol, you can feel rough spots and I hope these will smooth out as I shoot more. I’m not a competitive shooter so I can make the trigger work, though, so that isn’t an issue with me. I can see how the thumb safety interacts with the little spring-loaded bar and the fit of the thumb safety to the bar could be better. I find that my pistol fits my large hand well with its arch-mainspring housing and long trigger. There is nothing fancy about this pistol, other than it sports a lanyard loop on the arched mainspring housing. I have shot approximately 800 rounds through it, all of which was surplus metal-cased WWII-vintage ball or commercial 230 grain FMJ. I do not have any shooting results like you find described in the shooting magazines but I am very satisfied with the accuracy. Out to the twenty yard range, the holes in the target appear on the left side of the bullseye, so the rear sight needs the attention of a drift punch. I have experienced a number of jams, most of which were brought about, I believe, by an improperly seated magazine. Take those operator-error events away and I would guess that the pistol has choked on about four or five rounds, which occur usually on the second round and most of these events occurred in the early portion of the 800 round journey. I attribute these jams to the pistol working itself in. After I clean the pistol, I wipe all surfaces with CLP and then wipe them all dry. Then I apply Tetra Grease to the frame rails and the grooves in the slide (that is, any surface on the frame or the slide that contacts the other). Then I wipe those surfaces dry or as much as I can with Q-tips in the grooves. As to reliability, I did experience an event at my last trip to the range that was disconcerting. On the second shot of a full magazine, the floor plate flew off, followed by the magazine spring, follower and the rest of the ball ammunition. I never did find the errant floor plate. This magazine was the one provided with the pistol and the floor plate was fixed, that is, it wasn’t removable. I called Kahr Arms (the parent of Auto Ordnance) for an RMA according to the warranty instructions to return the defective magazine and was forced to leave a message as they indicated they were in the process of moving their offices. After no one returned my call, I got on their website and left a similar request for an RMA. After two weeks in total wait, I grew impatient and called again. I was rewarded with a human voice and he agreed to send me a replacement magazine and told me to keep the parts of the defective one for parts and to not bother with sending the defective article in. Once I was able to speak to someone, I was impressed with the way they handled my problem. Yesterday I received a package containing two replacement magazines, so they over-delivered on their warranty obligation. Although I the defective floor plate does give me cause for concern, I am treating that as an isolated event and am utterly convinced that the pistol is reliable. For the price, I am very satisfied with the quality of this pistol.